Let me just start this post by admitting that I am about as technologically savvy as a paranoid hippy who hangs out in the mountains and doesn’t believe in cell phones. In my world, cookies are something that come out of the oven and IP is something that stands for “intellectual property.” Neither of these things is relevant to computers, at least not for me. I am in utter awe of programmers. They’re like wireless wizards. I’m lucky that I figured out how to operate this blog without crashing WordPress. I was a dinosaur using AOL for years – my first email address was on AOL – but I finally made the switch to Gmail about two years ago. At the time, I was pretty pleased, given the fact that change is abhorrent to me. I found Gmail’s layout intuitive and easy-to-use, which is imperative for someone like me who needs it spelled out, preferably in large print. I know a fair few computer geeks, and they’ll spend hours trying to argue in favor of Windows, but at the end of the day, the main reason I am an Apple user is because it’s intuitive, it’s attractive, and dammit, I don’t have constant driver problems the way I did when I had a Dell running Windows XP. I couldn’t fix my own computer. My engineer roommate had to do it for me. (She loved every disgusting minute of computer repair.) I felt the same way about Gmail – it was the Mac of the email world, at least in my eyes. Google is in the midst of streamlining its accounts, which means that Gmail, YouTube, Google+, and approximately 60 other services will be sharing users’ personal data. Everything except Google Chrome, Google Wallets, and Google Books will be linked together. The big problem will all of this is that there is no opt-out. All Google users will be forced to comply with this new procedure. As I understand it, the way this will work is that if you Google something, for example “St. Louis Blues hockey scores,” you may be greeted later by hockey videos on YouTube. Many think it will also allow Google to target advertising, which is true, but more importantly, it is going to link your personal data and information to things that you may not necessarily want public. Let’s face it: one of the great things about the Internet is that you can peruse with relative anonymity, but with the new Google system, those days seem to be disappearing. Besides that, it would put vast amounts of personal data at the literal fingertips of hackers. Of course, lots of websites already do this, but Google is such a large system that it would be disastrous if their security were to be compromised. It doesn’t make sense to just hand over scads of information to cyber-criminals, and to those who say that it could never happen, I say, “Wake up.” There is always a determined hacker who can figure out how to beat the system that is currently in place. What is truly frightening to me is that Google will effectively be using emails to help them figure out the who, what, where, when, why, and how of users’ personal lives. Google can install permanent cookies on people’s computers which allows the company to keep track of what users are doing, including where they are. Google can mine information from mobile devices the instant that users access their accounts or enter search terms, according to The Washignton Post. This is all supposedly to streamline the online experience for Google users, but it sounds more 1984 than anything else to me. Do we really want perfect strangers to have access to all of our private information, including health, financial situation, political beliefs and concerns, and where we live and shop? Moreover, what happens if Google decides that they aren’t going to be scrupulous with this delicate information? Call me paranoid, but it seems like this could potentially be a problematic situation if they decide to sell information to, say, insurance companies, credit institutions, or the government? What if the government, under the usual guise of protecting us from terrorists, ourselves, and terrorists, decides to use this technology to “listen in” on our conversations? No thanks. While I can understand that Google is facing stiff competition in the fickle and ever-changing Web world, this move towards streamlining doesn’t seem like it’s going to be a winning proposition, in the long run. The potential consequences of making so many details of one’s life public are troublesome, at best, scary as heck at worst. One the upside, I will say that I’m glad that Google is giving its current users fair warning about this policy change. Logging into current accounts, it’s quite hard to miss the banners asking you to view the new policy. I do applaud their efforts to keep their users abreast of changes, because there are some companies that would not have given users the same courtesy. That said, I will be deleting my Gmail account for good as soon as I find a service that I find more palatable. I’m trying out Zoho for the time being, and although it isn’t as pretty or as easy to use as Google, it asks for zero personal information for its basic, free account, and that means a lot to this Lady, who places a high value on her privacy. If I like the results with the blog email account, I will switch over my personal accounts, too. Rest assured, however, that I will not be sticking around so that Google can inundate me with ads and mine my personal data all for the sake of making my life more convenient. I’m willing to accept slightly less convenience if it means that my personal data is safe. Check out the article below, if you are interested in the news story. I love conspiracy theories. Some of them I’ll ascribe some grains of truth to, and some are just fun to read (see David Icke’s reptilian theory). I figure that just because I’m paranoid doesn’t mean that they aren’t out to get me. One particular item that seemed like a crazy conspiracy theory several years ago is now popping up as a reality: the RFID chip. RFID stands for radio frequency identification chip. RFIDs skyrocketed to infamy when various folks out there claimed that RFIDs were/are going to be implanted into people to track their movements, buying habits, etc. Well, the FDA has approved RFIDs for personal implantation, but I don’t think the trend has caught on yet. That said, I also don’t believe that it’s totally out of the realm of possibility for someone to suggest that they be used in this manner at some point in the future. RFIDs are little bitty chips that can be scanned and read from (as of 2005) as far away as about 65-70 feet. Most of them don’t have their own power supply; they “come to life” when the scanner activates them. They can be programmed with information like serial numbers, barcodes, or identification for individuals. As it stands today, RFIDs are used in things like passports (mine is old and doesn’t have one, but my husband’s UK passport does), credit cards (Chase bank uses them), drivers’ licenses, clothes, and other items. Wait, clothes?! you say, bewildered. You betcha! Wal-Mart began a policy starting last year that they chip all of their clothes in all of their stores to prevent shoplifting. American Apparel apparently does the same thing with their tiny T-shirts. Europe has been doing it for some time, but the RFIDs are removed upon checkout and reused, which seems sensible enough to me. Wal-Mart RFIDs are not removed upon purchase. It seems it would be your job to remove the RFID, assuming you even know it’s there at all. Many people are becoming increasingly uneasy about RFIDs. While the technology certainly saves a few seconds and makes things more convenient, people are wondering if the benefits outweigh the risk of identity theft. If most Wal-Mart items are embedded with RFID chips, someone with a scanner – they aren’t that hard to make, apparently – could theoretically go through your trash and know what you’ve been purchasing. For items such as IDs and credit cards, the risk is more upfront: someone with a chip reader could access your information and use it do any number of sundry and decidedly inconvenient things. With passports, drivers’ licenses, and things like the Florida Sun Pass (Florida tollway card), how easy will it be for someone to steal our information? Do we really want the government or whatever subcontractor they’ve hired to do the job nosing through all of our information? They say that for states on borders, such as California, where many people cross the border for work and/or pleasure with some degree of frequency, it will make things easier. But again, is it worth the risk for this convenience? Also, theoretically, RFID chips in passports and such could be activated from just about anywhere. The government could potentially track you at any time. Is this really what we want? Of course, in response to the concerns about identity theft, at least one company has popped up that makes RFID scan-proof wallets and passport holders. They aren’t super-pricy, although I would make no claims about whether or not they work. Of course, you can also just make your own from aluminum and duct tape. (I had a duct tape wallet in high school. It was classy.) Aluminum?! you cry. Do I have to be a card-carrying tinfoil-hat-wearer now, Lady? Well, no. You could shell out $30-$40 and get the classy leather wallet. But the aluminum – or copper or any other metal – has the effect of creating a mini Farraday cage. In other words, it keeps unwanted signals from activating the RFID and reaching your precious information. And I’m not saying “precious” lightly – anyone who has ever had to deal with identity theft knows what a royal and costly pain in the posterior it can be! I am in Asia, and I can say now with certainty that RFIDs are being used here. How do I know? I found one in my school classroom that had fallen off or been ripped off of a piece of clothing that one of my kids was wearing. I happened to see that it had “RFID” printed in bold letters on the side. I snatched it up, brought it home, and took a picture so that all of you readers can see what they look like when they come attached to a clothing label. They are incredibly tiny, and if you weren’t looking for it, you’d likely never realize it was there. 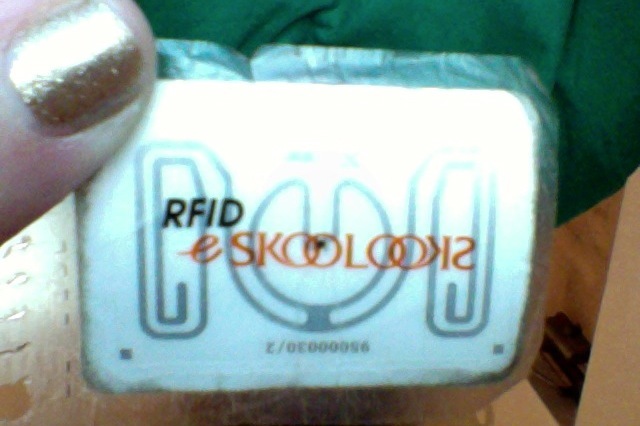 This is an RFID chip I found in my school. I assume it came from a clothing item.